contemporary life. Ebaugh is herself an ex, having left the life of a Catholic nun to become a wife, mother, and professor of sociology. Drawing on interviews with 185 people, Ebaugh explores a wide range of role changes, including ex-convicts, ex-alcoholics, divorced people, mothers without custody of their children, ex-doctors, ex-cops, retirees, ex-nuns, and--perhaps most dramatically--transsexuals. As this diverse sample reveals, Ebaugh focuses on voluntary exits from significant roles. 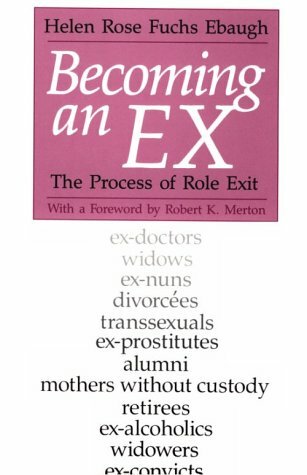 What emerges are common stages of the role exit process--from disillusionment with a particular identity, to searching for alternative roles, to turning points that trigger a final decision to exit, and finally to the creation of an identify as an ex. Becoming an Ex is a challenging and influential study that will be of great interest to sociologists, mental health counselors, members of self-help groups such as Alcoholics Anonymous and Parents Without Partners, those in corporate settings where turnover has widespread implications for the organization, and for anyone struggling through a role exit who is trying to establish a new sense of self.